A native of Moscow, the Russian pianist ALEXANDER GHINDIN has rapidly established himself as a seasoned artist and a major force on the international piano scene. In 1994 at age 17, he became the youngest winner ever of the prestigious International Tchaikovsky Competition, later gaining Second Prize at Brussels’ Queen Elisabeth Competition. He won the First Prize of the 2007 Cleveland International Piano Competition and the First Prize of the 2010 International Piano Competition of Santa Catarina in Brazil. Alexander Ghindin’s current season includes over 100 performances throughout the United States, Europe and Russia. Since 2006, Mr. Ghindin has been Artistic Director of his own concert series at one of Russia’s most distinguished concert venues, the Svetlanov Hall of the Moscow International Performing Arts Center. Alexander Ghindin graduated in 2001 from the Moscow State Tchaikovsky Conservatory, having completed master class studies with professor M.S. Voskresensky. By the age of 14, he had already won the Moscow Young Pianists’ Competition and, subsequent to his victories at the Tchaikovsky and Queen Elisabeth competitions, he joined the Moscow State Philharmonic as soloist in 1999, performing throughout Russia, as well as in Europe and Japan. In addition to a November 2010 tour of the United States with Vladimir Spivakov and The Moscow Virtuosi Chamber Orchestra, performing in Seattle, Beverly Hills, San Francisco, Denver, Chicago, Boston, Toronto, Wasgington, DC, New York City and Miami, a sampling of the numerous orchestras and ensembles with which Alexander Ghindin has appeared as soloist include the London and Munich philharmonic orchestras, Deutsches Symphonie-Orchester Berlin, Orchester der Stadt Freiburg, Orchestre de Paris, New Japan Philharmonic, Tokyo Metropolitan Orchestra, Orchestre National de Belgique, Orchestre Philharmonique de Liège, Flemish Radio, Swedish Royal Festival Orchestra, Rotterdam Symphony Orchestra, Orchestra de Philharmonique de Monte-Carlo, Orchestre National de Montpellier, Orchestre Philharmonique du Luxembourg, Israel Chamber Orchestra, Moscow Virtuosi Chamber Orchestra (with which he has also toured the United States), St. Petersburg Camerata, National Philharmonic Orchestra of Russia, Russian National Orchestra, and Grand Tchaikovsky Symphony Orchestra, as well as the orchestras of Thunder Bay, Toronto, Bordeaux, Strasbourg, Ekaterinaburg, Kazan, Moscow, Novosibirsk, Omsk, Samara, Paul, Prague, Latvia, Slovenia and Vilnius. He has collaborated with a host of today’s leading maestri, including Vladimir Ashkenazy, Vladimir Fedoseyev, Alan Gilbert, Paavo Järvi, Vladimir Jurowski, Dimitry Kitayenko, Krzysztof Penderecki, Tomasso Placidi, Saulus Sandeczkis, Thomas Sanderling, Yurij Simonov, Vasily Sinaysky, Leonard Slatkin, Vladimir Spivakov and Vladimir Verbitsky. An avid chamber musician, Mr. Ghindin has collaborated with Vladimir Spivakov and the late Nikolai Petrov for many concerts and recordings. Worldwide, Alexander Ghindin has performed in many of the most distinguished concert venues, among them: Carnegie Hall’s Zankel Hall and Lincoln Center for the Performing Arts’ Avery Fisher Hall in New York City, Washington’s John F. Kennedy Center for the Performing Arts, London’s Barbican Centre, Amsterdam’s Concertgebouw, Paris’ Salle Gaveau, Théâtre des Champs-Élysées and Théâtre du Châtelet, Munich’s Gasteig, Prague’s Rudolfium, Stockholm’s Riksallen, Rome’s Teatro Olympico, the philharmonic halls of Warsaw and St. Petersburg, the Moscow Conservatory, Tel Aviv Opera, Tokyo’s Sumida Triphony Hall. 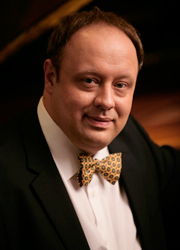 Alexander Ghindin has recorded over 24 CDs - on the labels of Capriccio, CD Accord, Decca, DML Classics, Naxos, Ondine, Piano Classics, Tri-M Classics, Russian Season - including the original versions of Rachmaninoff’s first and fourth piano concertos, with Vladimir Ashkenazy and the Helsinki Philharmonic Orchestra (2001, Ondine). His debut album on the Naxos label - an album devoted to sonatas and short pieces by Scriabin - was released in 2011. He has also appeared on television and radio throughout the United States, Belgium, France, Germany, Luxembourg, Poland, Russia, Japan and elsewhere. Alexander Ghindin wrote an original piano transcription of Maurice Ravel’s La Valse, which was published in Tokyo (2001) and St. Petersburg (2008). "LA VALSE - RAVEL PIANO WORKS"
Mr. Ghindin ended by conquering the devilish demands of Liszt’s Sonata in B minor, the highlight of the evening. The enthusiastic audience was rewarded with three encores. It must have been the thrill of their relatively young lives, playing a cornerstone of the repertory with the Cleveland Orchestra in Severance Hall. The lucky - and gifted - four were the finalists in the 17th biennial Cleveland International Piano Competition. It was Alexander Ghindin of Russia who garnered the whopping first prize for a series of muscular and assured performances, including a grandly conceived account of Liszt’s B-minor Sonata in the semifinals and a potent and nuanced reading of Rachmaninoff’s Third Concerto. Of the four, only Ghindin possessed the stage maturity of a world-class professional pianist. As a pianist, Ghindin is a formidable presence. His tone is big, and he elicits cataracts of sound from the instrument. There is great strength in his arms, wrists and fingers, and he is not afraid to unleash it. His technique, too, is developed to such a degree that he is able to respond to whatever impulse might occur to him at the moment. It makes for an exciting, unpredictable recital experience, in which a well-considered structural and narrative approach is the canvas on which he executes, vivid, sometimes mercurial flashes of inspiration. One could have imagined Rachmaninov himself at the keyboard with an Ormandy-era Philadelphia Orchestra behind him as guest soloist Alexander Ghindin tore into the Rachmaninov First Piano Concerto with Kevin Rhodes at the helm of the Springfield Symphony. It was that good. In pre-concert interviews, Rhodes made grand promises for Ghindin’s performance; Ghindin and everyone on stage delivered the goods, utterly justifying the standing ovation that swept the crowd. In the case of the Piano Concerto No. 3 in C Major by Prokofiev, as performed by Alexander Ghindin, we’re talking a whole lot of real, honest notes played extraordinarily well. He is one of those rare pianists who combines expressiveness with finely honed technique, so that every note he plays is struck with laser-like precision, yet each passage is so perfectly phrased that the music sounds as if he is improvising on the spot - that the soloist is not so much playing along with the orchestra as challenging it, dueling with it. Ghindin responded to the heartfelt standing ovation he received with an encore that was completely surprising and completely wonderful - John Philip Sousa’s The Stars and Stripes Forever, performed in a way that can only be described as orchestral. Rachmaninoff’s Piano Concerto No. 2 can be a trial if the music isn’t treated with absolute seriousness. From the brooding opening chords, Ghindin seemed to announce that he would not be a show-off or resort to bombast and cliché. Instead, he emphasized the music’s lyricism and connective tissue, stepping to the forefront when the piano needs to play protagonist and weaving the filigreed material deftly into the orchestral soundscapes. Ghindin refused to glide across the surface, preferring to keep the limber folk elements in controlled, quicksilver focus. The history of musical competitions shows that only a handful of top-prize winners go on to major concert careers. But Ghindin’s first recital here since taking first prize in August confirmed that he is no pianistic fluke. He was poetic and charismatic in ‘From Russia with Love,’ his program at the Cleveland Institute of Music. The advertising turned out to be truthful: The repertoire remained firmly entrenched in the pianist’s homeland, and he played as if he adored each of the gazillion notes his fingers projected. The enthusiasm of Ghindin's playing is hard to resist, and Tchaikovsky's huge Sonata doesn't appear on disc so often that a performance with such sweep and grandeur can be easily ignored. Sasha’s performance was stunning. We have had many fine pianists play for us, but none of them have come close to engendering the level of excitement and enthusiasm in our audience as he has - both last night and in his first recital for us in 2009. He is a rare artist: serious and imaginative in creating his programs and interpretations; generous and exuberant in performance. A very special talent. In Alexander Ghindin we are fortunate to find the perfect combination of artist and musician. His whisper, like that of great tragic actors of the past, is heard clearly even in the last row of the balcony, and his 'shout' never exceeds that of genuine emotion. He has total control of the Hall, speaking to each listener personally, conveying the innermost meaning of the piece he is playing. Much of its positive impression was owing to Alexander Ghindin, who was audibly in control of its intricate virtuosity without losing sight of its overall follow-through. Petrenko and the LPO were alert and attentive, while Ghindin’s encore of Tchaikovsky’s Lullaby was pathos itself in Rachmaninoff’s limpidly idiomatic transcription. Rimsky-Korsakov’s Concerto is a charming work, full of folksy whimsy, light-spirited sparkle and Russian ‘fragrance’. The twists and turns of the opening Moderato were fleetly negotiated by Jurowski and his soloist, Alexander Ghindin, and there was a refreshing airiness. Ghindin had all the notes under his fingers and conjured a sense of freedom and invention: the light touch of the trickling cascades provided glitter but there was also apt power when required.